The English Electric Lightning was developed as the operational culmination of research projects in Great Britain into high-speed flight. In 1949 a contract was awarded to the English Electric Corporation (EEC) to develop a high-speed interceptor based on the P1 research aircraft. Although development showed great potential for the Lightning to become a true multirole combat aircraft, the Air Ministry, believing that the Lightning would be an interim type, stalled development. What emerged was an austere point-defense interceptor, armed with just two cannon and two Firestreak missiles. Even still, the Lightnings, upon entering service in 1960, represented a quantum leap in capability for RAF Fighter Command over the Hawker Hunters it would be replacing, and, in all variants, would serve the RAF for nearly 28 years. The first Lightnings in service, the F1s of 74 Squadron, were quickly joined by the improved F1As of 56 and 111 Squadrons. The F1As could be distinguished from the F1s by the external cable conduits on both sides of the fuselage. The F1A, and all subsequent Lightning variants, could also be fitted with an in flight refueling probe underneath the left wing. The F1As were quickly followed by the F2s, which equipped two squadrons, 19 Sqn. and 92 Sqn. The F2s were the last of the first-generation Lightnings built with the pointed "witch's hat" tail; F3s would introduce the larger-chord tail closely associated with all later variants of the Lightning. The early Lightnings remained in front-line service until the mid 1960s, when they began to be replaced by the Lightning F3. F1As went on to serve in training units and in target facility flights. Most of the Lightning F2s were converted to F2A standard in 1968-69, which brought them up to near-Lightning F6 standard; the few F2s that were not converted were retired in the early 1970s along with the Lightning F1As. A number of airframes survive as gate guardians and museum pieces. As mentioned in the data block, the plastic inside is the Airfix early Lightning kit, first issued in 1998, and heretofore long out of production. As originally issued by Airfix, the model could be built into all variants of the Lightning with the small ventral tank: the F1, F1A, F2, and F3. 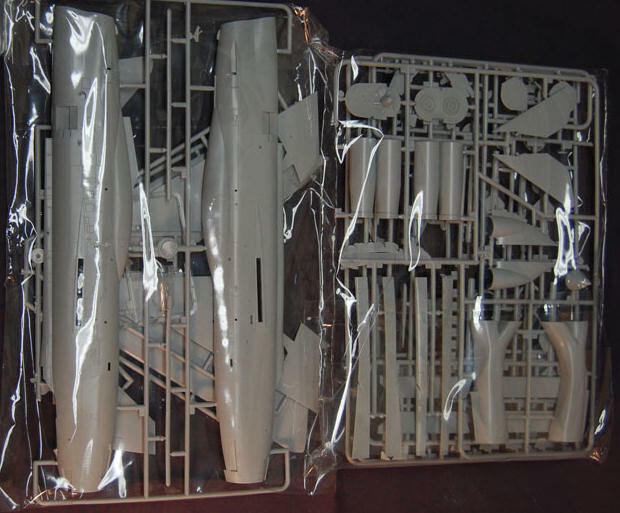 While all the parts are present for these variants in the Eduard kit, Eduard's instructions and decals only cover building the F1A and F2 variants. F1 and F3 builders will need to obtain copies of the Airfix instructio ns in order to build accurate models of these types. The parts are packaged in two plastic bags. 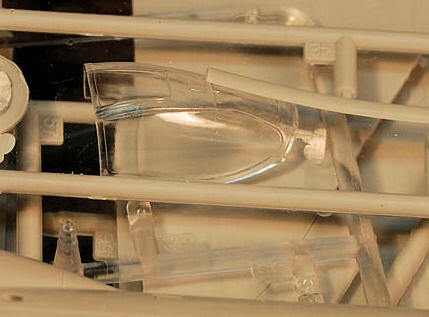 On my kit the clear parts were unbagged and placed between two sprues; unfortunately, they chose the cable conduit parts to put them next to, so my clear parts arrived scratched, and one of my cable conduits was warped. Individual bagging was indicated here! Molding overall is very good, with no sink marks and little flash. Surfaces are nice and smooth, with nicely engraved lines used for panels. The external cable conduits are separate parts, which means you can leave them off and easily backdate this model to an F1, or, by using the longer cable conduit parts and late-type vertical tail, make an F3. Outline accuracy is excellent, and it compares very favorably to photos and to published plans. The one external area where Airfix fell down on the job concerns the gun outlets on the fuselage. Instead of openings, the gun outlets are molded as depressions that look nothing like the real thing! The easy way out is to either build the model as an F3, which carried no guns, or do a target facilities aircraft which usually had the gun openings plated over. Otherwise the gun openings will need to be made by the modeler. On my Airfix Lightning build I used the F3 plates and drilled out my gun openings, all 4 of them, on my 92 Sqn. F2. using a small burr. Yes, that had a high pucker factor. Eduard, this is where resin parts would have been a big help! Interior details, as provided by Airfix, are oversimplified, and this is where Eduard's parts are very helpful. Standard nickel-finished photo-etched parts are provided for the wheel wells and landing gear, and color photo etch is provided to replace the instrument panel and side consoles. Unfortunately on the color photo-etch Eduard made the same mistake they did with their 1/32nd scale cockpit set, in making the base color medium blue-gray instead of black, as it should be for all Lightning variants up to and including the F2; some handy masking and careful overpainting of the etch parts will be needed here. Separate instrument panels are provided to account for differences between the F1A and F2 layouts--well done there. The new ejection seat is a much more complete representation of the MB Mk. 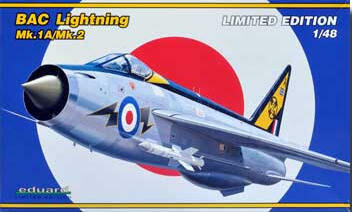 4 seat used in the Lightning than Airfix's effort. The seat is well cast in gray resin, with color photo-etch seat belts. There are also additional parts for the seat in resin for the oxygen bottle and regulator, plus nice etch parts for the levers--well done! As I alluded to above, I've built this kit in its earlier Airfix incarnation. Overall component fit is very good, and the model assembles easily. Fitting the leading edges is a bit tricky, so go slow there. Probably the hardest part of this build will be handling the photo-etch parts. 1. XM172, F1A, 56 Sqn. "Firebirds" 1963 display scheme, overall natural metal with a red fuselage spine and vertical fin, with red leading edges on the wings and stabilizers. 2. XN786, F2, 92 Sqn., overall natural metal with a blue fuselage spine and vertical fin. 3. XN794, F2, 19 Sqn., dark green over natural metal. 4. XM184, F1A, 111 Sqn., overall natural metal with a black fuselage spine and vertical fin, and a wing commander's badge on the tail. Eduard made some mistakes on the markings, both involving light blue! First, the light blue surround for the 56 Sqn. roundel bars was omitted; the bars themselves are undersized also. If you have the Airfix kit, you can use the roundel bars from their decal sheet, which have the light blue surrounds and are the correct proportions; they will work fine with Eduard's roundels. Also, use the less ornate squadron badge (decal 53); the more ornate badge looks good, but probably wasn't flown on an operational aircraft. Second, the 19 Sqn. roundel bars were printed in light blue and white rather than the correct dark blue and white. Eduard also erred on the decaling instructions for 19 Sqn. ; the underwing roundel should be the Type D roundel used on the overall natural metal schemes. That, at least, is an easy fix. Careful work with masking and painting will be needed to redo the roundel bars. The markings for 92 and 111 Sqns. are fine, and both will build into colorful and dramatic Lightnings once completed. The black and yellow "Treble One" markings are more associated with the F3 variant, but they flew on F1As as well, and this is the first time that I know of that decals have been made for the F1A flown by this unit. Full stenciling is provided for one airplane, along with missile markings for both the Firestreak and Red Top missiles. (Again, the Red Tops go to the spares box, unless you're building an F3). 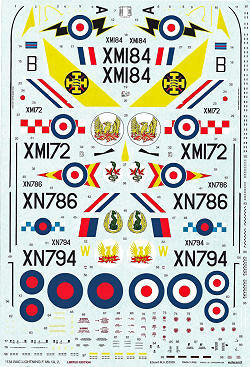 The retail price looks shocking at first, but given that the going rate for Airfix Lightning kits without extras on eBay was around US$50.00, this boxing gives you the kit and most of the aftermarket details you will need for about the same cost as rounding up the aftermarket bits yourself. The base kit is very accurate and easy to build, and the provided details will make it that much better. Recommended.